Are you looking for a perfect gift for a baby? 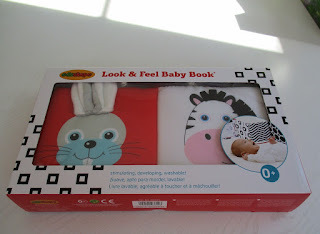 The Look and Feel Baby Book by Edushape is a can’t miss choice. If you have been to a baby shower you know that they will get lots of necessary equipment, clothes and diapers, etc. 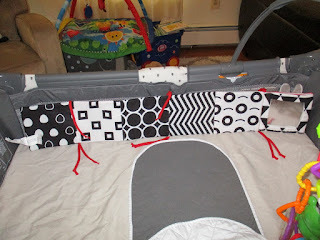 But they are usually short on things that will stimulate a baby’s development and entertain him. The Look and Feel Baby Book does just that. It has been tested with my three month old nephew and he loved it. The book comes in this attractive box and opens up to fit on the side of a pack and play or crib. It has two sides and each has six panels for baby to enjoy. One side has smiling animals and the other has black and white shapes – more on that later. 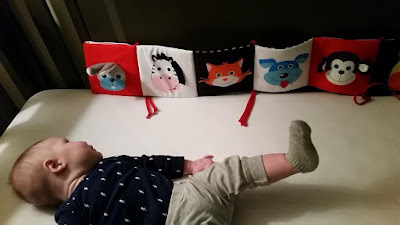 It is washable and each animal panel has a different feature that will be entertaining for a baby – crinkles, ribbons, felt, strings and squeaking. I am not a baby development expert but I knew that black and white are thought to be good for a baby’s visual development. Since this item features a black and white side, I thought I’d do some research on this concept. I read several articles and I recommend this one at the Ask Dr. Sears website if you are interested in this topic. Basically, at birth, a baby’s retina is not fully developed. The retina is the back layer of the eye that detects light. An adult retina can distinguish many different shades of light and color, but a newborn retina can only detect large contrasts between light and dark, or black and white. So all these years that we were using pale pink and blue for babies - this was not the best thing. Who knew? But NOW you KNOW so you will want to use this information in choosing items for a newborn baby. Here is my three month old nephew enjoying the animal panels in his crib. I took these pictures in the Pack n’ Play so you can get a close-up of both sides. 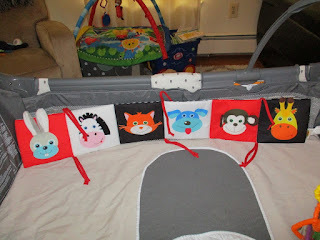 The animal faces side features high contrast pictures with crinkles, ribbons, felt , strings and squeaking for more sensory development. The black and white geometric shapes and a mirror panel side will aid in visual development – and isn’t it cool. Edushape is a 34 year old company that specializes in quality children’s toys which promote successful developmental learning through play. 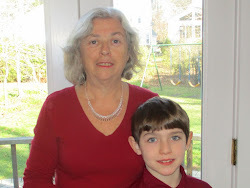 Their products are mainly designed for ages Birth to 5 years old. You can see all of their products at their website here. This review is my own opinion. I was not compensated to write this article. I did receive a free sample in order to complete the review.